An outstanding rushing defenseman who earned Hall of Fame honours through his contributions over fourteen sterling NHL seasons, Joseph Albert Pierre Paul Pilote was born December 11, 1931 in Kenogami, Quebec, a small town 200 miles due north of Quebec City. "I've always liked hockey," Pierre admits. "I'd listen to it on the radio. There was one station where we lived that carried the Montreal Canadiens." Although Pierre, the oldest of six children, enjoyed hockey, another sport captured his imagination while growing up. "Baseball was my life then," he admits. "I was on two All-Ontario championships and I thought I'd be scouted for the majors. That was my dream." Nevertheless, like most boys his age, Pierre also played street hockey. "I never played organized hockey in Kenogami but I watched an awful lot of games," he states. "I didn't have much money so I used to sneak in about an hour before a game, stand on the snowbanks and watch the senior clubs play. After standing there for three or four hours, it was hard to walk home with frozen legs! I watched it and it all came back to me once I started playing professionally." Pierre's first forays on-ice started from rather humble beginnings. "My first pair of skates were my mother's skates," he laughs. "We moved to Fort Erie (Ontario) when I was twelve or thirteen years old. By the time I was sixteen, the guys said, 'You're French-Canadian, you should be able to play hockey,' so I had to buy myself a pair of skates. I bought my first skates from Canadian Tire for $16 - a nice, black pair of skates. I didn't know how to get fitted for them. The skates were way too big. There was a big German guy working with me in the factory and I told him I had a beautiful pair of skates that I bought for $25 but I'd let him have them for $20. I made $4 on the deal! Then I went back and bought a pair that fit me." Quickly, Pierre's talents emerged and people sat up and took notice. "I started playing industrial league hockey but was also playing in Buffalo, New York on Sunday afternoons," Pilote relates. "I found out in March that the Junior B team from Niagara Falls was practising in Fort Erie. I asked if I could practice with them. The guy laughed at me but said, 'Sure. Why not?' In those days, I used to play centre. I went out there and scored about five goals and did well. The team was already in the playoffs so that was no time to be picking a hockey team. I asked the coach, 'How'd I do?' He said, 'You did real well, but we're not really looking for forwards. We're looking for defensemen.' It was a nice way to say 'I don't need you,' but I took him seriously. The next year, I was playing industrial league hockey again but I started playing defense and towards the middle of the season, the Junior B guys came and got me. I played one year with them and then the scouts came around." Interest in Pilote was strong, with both the Chicago Black Hawks and New York Rangers pursuing the talented youngster. But another party emerged that drew great interest from the Pilote family. "Rudy Pilous had just taken over as manager of the (junior) St. Catharines Teepees," Pierre remembers. "They were owned by Buffalo (of the American Hockey League). Rudy came to the house and Dad got involved. When Rudy left, my Dad said, 'This is all right! You go play Junior A hockey in St. Catharines and I can drive to every game very easily (Fort Erie is a half-hour drive from St. Catharines). And then, when you play for Buffalo, you can stay at home, right here." The plan worked like a charm for more than five years. But there was another reason the Pilote family was comfortable making the decision for Pierre to play with the Tee Pees. "My Dad said, 'That Rudy Pilous, he's French-Canadian so he's got to be an honest guy.' We found out later that Rudy was Polish and had changed his name from Piluski to Pilous." The junior team had been known as the St. Catharines Falcons until 1947-48 when they were purchased by Thompson Products and, using the initials of their sponsor, changed their name to the Tee Pees. Former NHL player Art Jackson was the coach of the junior squad when Pierre attended his first training camp in 1950. "When I went to training camp, the Tee Pees kept cutting guys and got down to about twenty players," says Pierre with a smile, remembering how aggressive he had been. "When they got to me, Jackson said, 'We've got to cut him.' Rudy Pilous said, 'Why do you want to cut him?' Jackson said, 'If we leave him on the ice, we won't have any players left!' Rudy said, 'No, he's going to be a good hockey player.' Two days later, Rudy took over both coaching and managing. That was my angel right there. It could have gone the other way and you wouldn't be writing this story!" Pierre made the team and had a fine season in 1950-51, finishing the campaign with 13 goals, 26 points and a league-high 230 penalty minutes. The next year, he progressed even further, scoring 21 goals, collecting 53 points and accumulating a more reasonable 139 minutes in penalties. The parent Buffalo Bisons took heed and brought Pierre up for two games that season. The Bisons made Pilote a permanent member of their squad in 1952-53, and for three seasons, Pierre honed his skills on defense. The Chicago Black Hawks made the Bisons their number one farm team and in 1955-56, Pierre Pilote split the season between Buffalo of the AHL and Chicago in the NHL. "From the time I started playing hockey, I never thought about the NHL," Pierre admits. "I just thought about making the club that was right in front of me, then I'd move on. I made the Tee Pees, then I thought about the next step. I made Buffalo and when I was playing in the AHL, I thought, 'Maybe I've got a chance at the NHL.'" When Pierre first joined the Black Hawks, the team had a long history of losing. In the fourteen seasons between the beginnings of the Original Six era in 1942-43 and Pilote joining the team in 1955-56, Chicago had made the playoffs exactly three times, and had finished dead-last seven times. "Chicago wasn't a very good team at the time," Pierre recalls. "Our strength was our goaltending. Al Rollins played great for us most every night, and our backup, Hank Bassen, was pretty darn good too. But we had a lot of older players who were coming to the end of their careers - Tony Leswick, Gus Mortson, Harry Watson, Ed Sandford." Cracking any NHL line-up was difficult during the six-team era, but Chicago possibly afforded Pilote his best chance at making hockey a career. "I got a chance," he admits. "It was tough. You had to carve yourself a job. The way I played was with a lot of enthusiasm. I used my head but it took me four or five months to finally settle down and play smart hockey." The ill fortune of the Hawks reversed fairly dramatically, and Pierre credits one man with the franchise's eventual transformation. "It started when Tommy Ivan came over as general manager," explains Pilote. "He made his mind up that he was going to build up the Black Hawks. The first thing he did was acquire Glenn Hall. You've got to be strong down the middle. The second thing he did was buy out the Buffalo franchise and its farm system, which in turn made all their affiliates available -- Bobby Hull, Stan Mikita, (Moose) Vasko, me, Hank Ciesla, Kenny Wharram. I was the first one from that group to make it (to the NHL)." 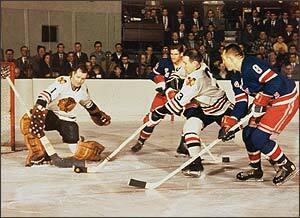 By 1958-59, Chicago had climbed into contention, making the playoffs for the first time in five years. "We played better," explains Pierre. "We never played defensive hockey. We always played offensive hockey with the players we had. We were a force to be reckoned with." 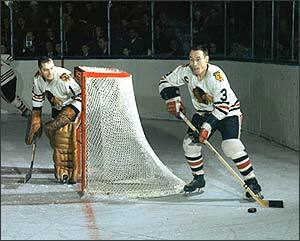 Glenn Hall was in net with one of the NHL's premier defense pairings, Pilote and another former Tee Pee, Elmer (Moose) Vasko, on the blueline. 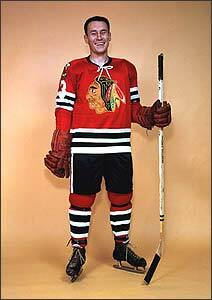 Ed Litzenberger, the captain of the Hawks, had been a regular in the NHL's top scorers through the late-1950's. High-flying Bobby Hull led the league in scoring in 1959-60 with 81 points, and Stan Mikita would follow suit a few years later. Pierre was made an assistant captain and although playing a rugged but sound game, had one stretch where he played 376 consecutive games before a shoulder injury ended the streak during the 1961-62 season. In 1959-60, Pilote was named to the NHL's Second All-Star Team, an accomplishment repeated each of the next two seasons. Then, in 1962-63, Pilote was voted a First Team All-Star, the first of five straight selections. 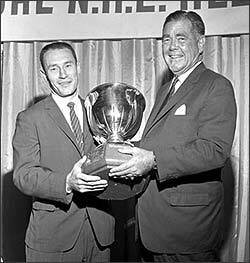 Between 1963 and 1965, Pilote was also a three-time recipient of the Norris Trophy as the NHL's best defenseman. Pierre was consistently ranked among the top-scoring defensemen of the era. His 59 points (14 goals and 45 assists) in 1964-65 was an NHL record for defensemen in the pre-expansion era. "I always believed that if I had the puck, the other team didn't have it," he shrugs. "My first instinct was always playing forward. I'm what you call 'Mr. Xerox'  I copy. If it's good for you, it's mine. My hero was Doug Harvey. I picked up tricks from him and from other guys and that's how I learned. I watched many, many games and some things imprinted on my mind and came back." But Pierre adds a further explanation. "If I played strictly defense, I wouldn't earn as much as if I played defense and offense. There weren't many laurels just being a defensive player. If you can do both, why not?" While with the Black Hawks, Pilote won the Stanley Cup in 1961, breaking the Montreal Canadiens' five-year stranglehold on the championship. That summer, Chicago's captain Ed Litzenberger was traded to Detroit, and Pierre was selected as the Hawks' new captain, a position he proudly held from 1961 until he left Chicago in 1968. "You have to be a good leader and a good politician," Pierre explains. "We had three or four superstars and you had to know how to handle these guys. No matter how good a captain you are, it's just like politics -- you have to win a majority. You have to have the guys on your side but there's always a little bit of dissension and you're always trying to fix it before it gets too far and gets into the office. If a guy had a beef, we'd talk about it. If it was reasonable, I'd go to the management. I just tried to lead by example." In 1968, after thirteen seasons with the Black Hawks, Pierre was astonished to learn that he had been traded to the Toronto Maple Leafs. "The late Red Burnett, who was a writer for the Toronto Star, called me and asked me about the trade," explains Pilote. "I said, 'What trade?' It's amazing how they do things after you devote yourself for so long to one team. It was a Mickey Mouse way of doing it. Tommy Ivan could have called me  I was a good friend of his. But anyway, it took me a month and a half to decide to go. I had made up my mind not to be involved in hockey. I had some things going in business but then it hit me  yep, hockey is my life. I made up my mind and said the deal was on." 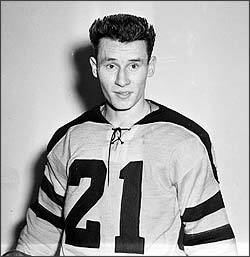 The Toronto Maple Leafs sent promising young winger Jim Pappin to Chicago for the veteran Pilote. "We moved to Port Credit (Ontario), and I started well," he recalls. "Toronto made the playoffs that year and Chicago did not. That was the year my friend Pat Quinn nailed Bobby Orr and woke up the lions." On April 2, 1969, in Game 1 of that spring's playoff, the Bruins' star Orr was flattened by a Quinn bodycheck that precipitated a wild melee involving most members of both teams. Boston went on to win the contest 10-0 and took the series in four straight games. April 6, 1969 proved to be the final NHL game for Pierre Pilote. He retired having played 890 regular season NHL games, in which he scored 80 goals, 418 assists and 498 points. "I had started some businesses and Emile Francis had offered me a position to go to New York (Rangers) to work with their rookies. I had played with four or five rookies in Toronto  Mike Pelyk, Jim Dorey, Pat Quinn -- and got along real good with them. But when I look back, going to Toronto was the best move I could have made. I've been very successful in the Toronto area, I've been taken in by the ex-Leaf players (with the Toronto Maple Leafs' Alumni), I'm involved with the Hockey Hall of Fame. Toronto is the Mecca of hockey. They haven't forgotten me. If I was in Chicago, it might have been entirely different, but I'm glad I came over." In 1975, Pierre Pilote's accomplishments were recognized by his election to the Hockey Hall of Fame. "After I retired, I started thinking, 'I wonder if I'll ever be in there?' I never thought about it when I was playing. It was never the end result in my mind. It was the next step," Pierre states. He was joined that year by teammate Glenn Hall as well as Toronto's George Armstrong, Ace Bailey and Gordie Drillon and Builders Frank Buckland and William Jennings. "It was a great moment," he smiles, reflecting. "It was so simple then. It's a great thing. When I look back at it, my young kids were there, my wife, my father, my sister. It was a great feeling." A superlative career that included both team and individual awards went Pierre's way. "I've been very happy and very lucky," says Pierre. He stops for a moment and adds one more thought. "But what made it great was the day I married Annie."